The arrival of the Italeri ELCO boat some years ago prompted a number of the after marker resin manufactures to produce some alternative figures to people the boat. Royal Model have produce a number of US Sailors for this purpose shown in a variety of everyday working poses. 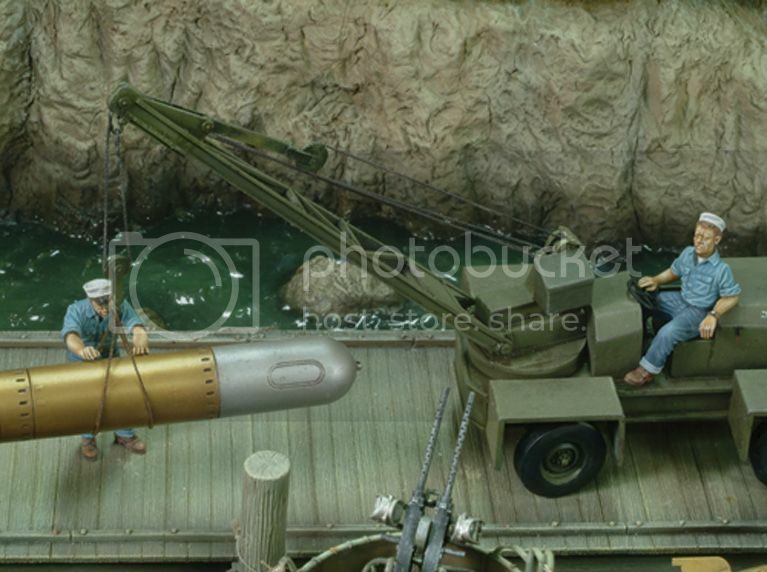 This is a look at Kit No.537, a figure of a US Sailor, swabbing the boat deck. The figure comes packed in a small cardboard box with a color picture of the contents on the front and the product information and manufactures logo in place. The figure is contained with in a small zip plastic bag inside the box. The box is vacuum sealed. Cast mainly in a light gray resin the figure consists of 9 parts. The body and torso cast as one piece with separate head, arms, boots and accompanied by a swabbing cloth and a broom and scrubbing brush. The right arm and head of my figure were case in a cream resin. I could see no damage to the parts that might cause concern. 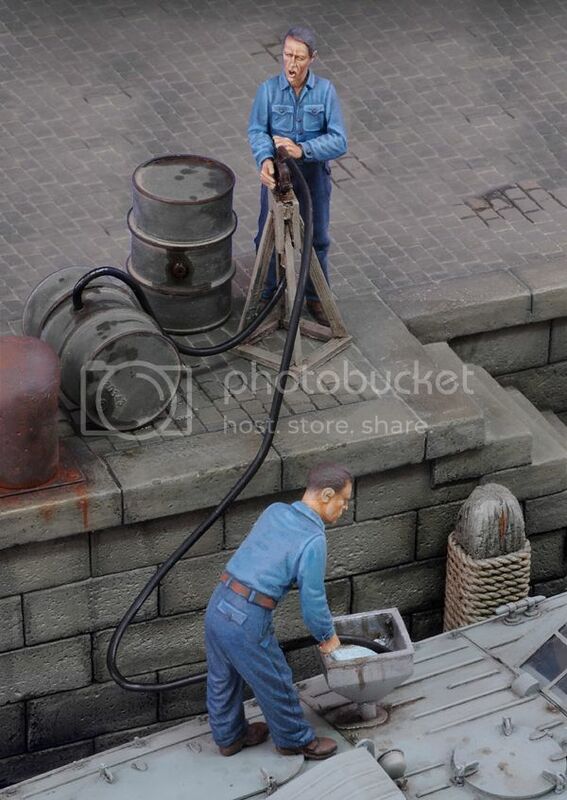 The photograph shows a bucket prominently in the picture but no bucket came with my figure so you may have to source your own, but my feeling is that this part is simply missing from the kit, at least from the promotional pictures I’ve seen. The figure depicts a kneeling sailor in the time honored activity of swabbing the boat deck. The figure is dressed in work shirt and denim trousers, and sailors cap. The casting of the parts looks good and the uniform has nice folds and creases. The arms come as separate items with the shirt sleeves rolled up, and the left arm sports a watch on the wrist. Boots/shoes are also a separate item and need to be added. The face shows that of a young man, his cap atop a fine crop of hair. The detail is good and the face should paint up well. There was a small air bubble on his chin that would need filled but other than that a very acceptable head. His expression is that of one resigned to a manual but necessary task. You would need to add a shaft to the large broom. Both the broom and scrubbing brush come with bristle detail. The scale and body proportions looks in keeping with the smaller end of 1/35 scale but should be perfectly acceptable, especially as he is in a kneeling position. The sailors boots and a swabbing cloth come on a separate mould and both have good detail. 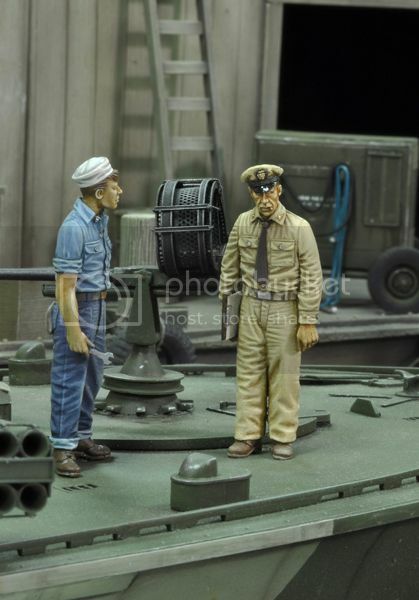 This was my first look at any of the Royal Model USN figures and they look pretty good. This one gives a very useful figure who could be put to work in a number of locations on the boat or elsewhere for that matter. The casting looks very sharp, and the clean up should be minimal. Lack of a bucket was a bit annoying and for the price the inclusion of a broom shaft would not be an unreasonable expectation. Overall a very good figure, who could be enjoyed by figure painters or diorama builders alike. He will work well on the ELCO or any other USN boat placed in a non action type scene. Highs: A versatile and usable figure for many USN scenes. Spend many hours with my Bucket, sponge, and scouring powder washing down the engine room equipment. Then more hours polishing the bright work. For a bucket, pick up the Part PE set, or the new RB buckets made from turned brass. I agree with Roy, as it would have been nice as a set of sailors with a PO/CPO supervising the work detail.